While I was walking through the farmers market I noticed some nice looking carrots and I realized that I have not done anything with carrots so far this year. I grabbed some carrots right away. 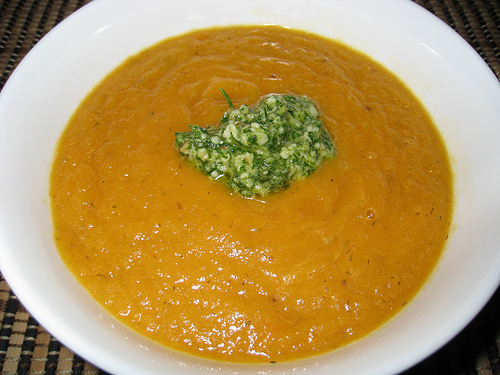 When I was looking for carrot recipes I came across this recipe for carrot soup with dill pesto. Dill is one of my favorite herbs and I have been wanting to try making a pesto with it for a while. 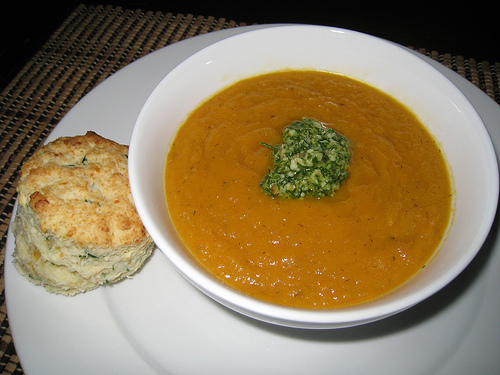 I was sold on the carrot soup with dill pesto recipe. I found the same recipe on several sites on the web so it looked promising. I did not end up having enough chicken stock so the soup was pretty thick, though I like a thicker soup so it was not a problem. I also did not have enough dill so I added some parsley to round out the pesto. The soup was pretty good. It was nice and simple and placed the carrots right up on center stage. The dill pesto was also pretty good and went well with the soup. I will have to look for some more ways of using the dill pesto. Add the onions and saute until tender, about 10 minutes. Add the carrots, dill and chicken stock and simmer until the carrots are tender, about 20-30 minutes. Puree the soup with an immersion blender (or in a blender) adding more chicken stock to make it smoother if desired. Puree everything in a food processor (or in a mortar and pestle) and add oil until it comes to the consistency that you like for your pestos. I have never made pesto with dill: I should try. Your carrot soup sounds quite comforting. That soup looks yummy! I always team carrots with coriander in soup, but this is a good variation! I am stuck right now on carrot and butternut squash soup with fresh ginger and tumeric powder. Absolutely yum! I would have some of your dill pesto on potatoes as a potato salad, it would be heavenly! A great looking soup and te dill pesto is quite unique, good show Kevin! Dill pesto… sounds very interesting. Looks like an excellent, simple carrot soup too. Dill pesto sounds just fascinating. This is a great-sounding dinner! I have never had carrot soup before, but I have always wanted to try it. This one sounds great with the addition of the dill pesto. Yum! The pesto sounds wonderful, as does the soup. And though you didn’t mention them, your biscuits are lovely and look perfectly flaky. YUM!